Ruby, Io, Prolog, Scala, Erlang, Clojure, Haskell. 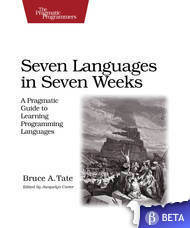 This book has an audacious goal: to present a meaningful exploration of seven languages within a single book. You can explore the concurrency techniques that are quickly becoming the backbone of a new generation of Internet applications. Find out how to use Erlang’s let-it-crash philosophy for building fault-tolerant systems; understand the actor model that drives concurrency design in Io and Scala; and learn how Clojure uses versioning to solve some of the most difficult concurrency problems. X10 is a programming language being developed by IBM at the Thomas J. Watson Research Center as part of the PERCS project funded by DARPA's High Productivity Computing Systems (HPCS) program. Its primary authors are Kemal Ebcioglu, Vijay Saraswat, and Vivek Sarkar. X10 is designed specifically for parallel programming. It is an "extended subset" of the Java programming language, strongly resembling it in most aspects, but featuring additional support for arrays and concurrency. X10 uses a Partitioned global address space model. It supports both object-oriented and non-object-oriented programming paradigms. This book is a compilation of wikipedia articles on X10.